Capricorn constellation is located in the southern sky. Its name means “the goat” in Latin. 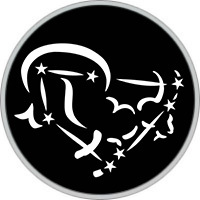 Capricornus is one of the 12 zodiac constellations and it is represented by the symbol ♑. It is one of the faintest constellations in the sky. Like other constellations of the zodiac, Capricornus was first catalogued by the Greek astronomer Ptolemy in the 2nd century. The constellation is associated with two mythical creatures from Greek legends: the deity Pan and the goat Amalthea, who suckled Zeus when he was very young. Capricornus constellation is home to several notable stars, as well as to the famous globular cluster Messier 30. Even though Capricornus is the second faintest constellation in the sky, after Cancer, it is associated with myths and images that go way back to the 21st century BC. The story of Capricornus originated with the Babyonians and Sumerians. The Sumerians knew it as the goat-fish, or SUHUR-MASH-HA, while the Babylonian star catalogues dating back to 1000 BC mention the constellation as MUL.SUHUR.MAŠ, also meaning “goat fish.” In the early Bronze Age, Capricornus marked the winter solstice and, in modern astrology, Capricorn’s rule still begins on the first day of winter. The Greeks associated the constellation with the forest deity Pan, who had the legs and horns of a goat. Crotus, his son, is usually identified with another amphibious creature, represented by the neighboring constellation Sagittarius. Pan was placed in the sky by Zeus in gratitude for his coming to the other gods’ rescue on several occasions. During the gods’ war with the Titans, Pan helped scare the Titans away by blowing his conch shell and he later warned the gods that Typhon, a monster sent by Gaia to fight the gods, was approaching. He also suggested that the gods disguise themselves as animals until the danger passed. In the myth, Pan eluded the monster himself by jumping into the river Nile and turning the lower part of his body into that of a fish. Zeus eventually killed Typhon with his thunderbolts. In reference to the myth, Capricornus is still often depicted as a goat with the tail of a fish. In another story, Capricornus is identified as Amalthea, the goat that suckled Zeus when he was an infant, hiding from his father Cronos. Cronos had devoured his other children, all future gods and goddesses, because of a prophecy that he would be overthrown by one of them. How to find the constellation Capricorn in the sky? Capricornus is the 40th biggest constellation in the sky, and is visible for observers located between latitudes +60° and -90°. From northern latitudes Capricornus can be seen from July to November, and in the Southern hemisphere from winter to late spring, where its appears upside down relative to the Northern hemisphere. Capricornus can be seen low on the southern horizon between Aquarius and Sagittarius and is located in an area of the sky known to the ancients as the Sea. This region is rich in constellations with water-related themes, such as Pisces, Piscis Austrinus, Aquarius, Eridanus, Cetus, Delphinus, and Hydra. 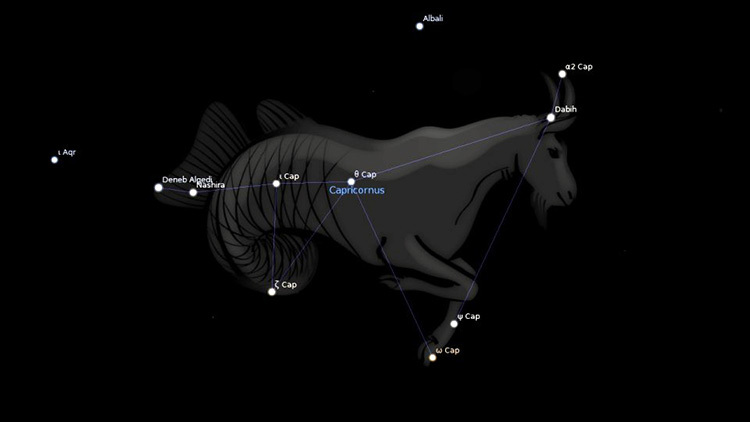 Capricornus is one of the faintest constellations, which makes it even harder to discern the shape of a goat. From the Southern Hemisphere, it is possible to make out the shape of a rhinoceros horn, but from the far northern hemisphere, the constellation looks distinctly triangular, and appears more like a kite, or perhaps a Chinese fan.